You have the incredible potential to be, do, and receive whatever you desire, imagine, and truly believe. Unfortunately, however, only a small number of people achieve their full human potential, because they fail to recognize and harness the infinite power of the subconscious mind—the divinity within them and around them. The secret to success is no secret. It has been in practice for thousands of years. The most successful people throughout history are not those who merely accept the reality presented to them but those who imagine a better reality and believe in it so deeply that they are actually able to create a new reality—to change the state of being around them. Part 1: Affirmation Essentials: Here you discover how to plant thoughts into your subconscious mind, so it can begin to work miracles in transmuting your thoughts into reality, often with little or no effort on your part. Part 2: Weekly Affirmations: These 52 weekly affirmations empower you to improve every aspect of your life, including your health, wealth, relationships, marriage, and career. Each weekly affirmation is accompanied by commentary that places the affirmation in the context of real life, so you can more clearly imagine and start appreciating the new reality you are about to experience. 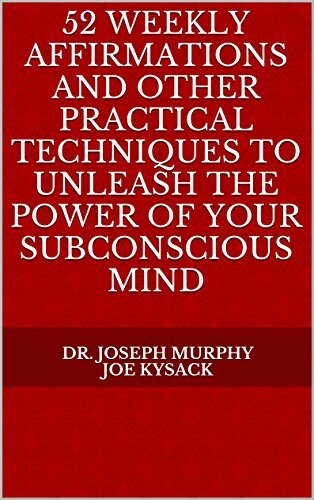 Part 3: More Techniques for Planting Thoughts in the Subconscious Mind: These additional techniques enable you to plant thoughts in your subconscious mind and crystalize your vision. The more clearly and distinctly you are able to imagine yourself being, doing, or receiving that which you desire, the more certain your desire will be fulfilled. Part 4: Unlock the Infinite Power Within You: Part 4 reveals the principles upon which the practice is based and relates true stories of people who solved problems, healed themselves and others, saved lives, improved relationships, achieved career success, and attracted wealth, through the power of affirmation. Part 4 also reveals the role the subconscious mind plays in out-of-body experiences, extrasensory perception, mental telepathy, clairvoyance, precognition, remote viewing, and other psychic powers. This book is your personal guide to leading a happier, wealthier, and more fulfilling life. By following the guidance offered here, you can stop going through life as a victim of circumstances and become the master of your own destiny. You discover how to harness the power of your own mind and the infinite resources surrounding you to be, do, and receive whatever you desire, imagine, and believe.